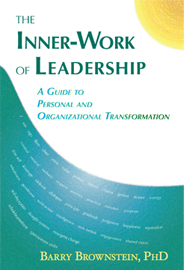 My new book, The Inner-Work of Leadership, is now available at Amazon. Find it by clicking here. In writing this book, I hope to help readers identify and remove barriers within themselves that interfere with effective leadership and with living a fulfilling life. If you find the book to be a helpful guide to healthy change, I would be grateful if you post a review of the book at the Amazon page for this book. Positive reviews at Amazon are very important; they influence many book buyers. Your post will help this book reach a broader audience. I have set up a Facebook group for readers of The Inner-Work of Leadership. Please consider being a founding member of the group. To join, click here. I hope the Facebook group becomes a community for those who have been influenced by the book and related material. I encourage you to invite others to join. If you would like to share this book with others in your organization, quantity discounts are also available at the book web site. Finally, at the web site you will find instructions on how to receive a free autographed bookplate for your copy of the book. “The Inner Work of Leadership provides a clear path and roadmap for the open minded reader to reexamine and re-think their paradigms about leadership. The Inner Work of Leadership is a groundbreaking must read for those currently in leadership positions and for those aspiring to leadership positions.” –Peter Quinn, Senior Vice-President for Corporate Development, Greenhorne & O’Mara, Inc.
Is There Order Without Control? Do You Eat Your Broccoli? In the preface of the book, I acknowledge that ongoing dialogue with my readers and my students has been essential in its writing. Thank you for your wisdom and for every question, every challenge, and every opportunity you gave to me to express ideas that I believe respond to our universal need to find ourselves as we join with others. If The Inner-Work of Leadership touches the lives of others, you will have helped make that possible. To order at Amazon, simply click here.